Have you ever tried to take a picture of yourself using the camera on the back of your iPhone? It’s pretty difficult. So you may be wondering how you see so many perfectly framed shots on social media that people have taken of themselves. It’s much easier to take these kinds of pictures if you use the camera on the front of your iPhone instead. The iPhone has a camera on the back of the device that is used for traditional pictures, and it also has a camera on the front of the device. There is a button on the Camera app screen that can switch between these different cameras, thereby allowing you to use the camera that is right for the task. The steps in this article were performed on an iPhone 7 Plus in iOS 10.3.3. These steps will also work on other iPhone models with front and rear cameras. 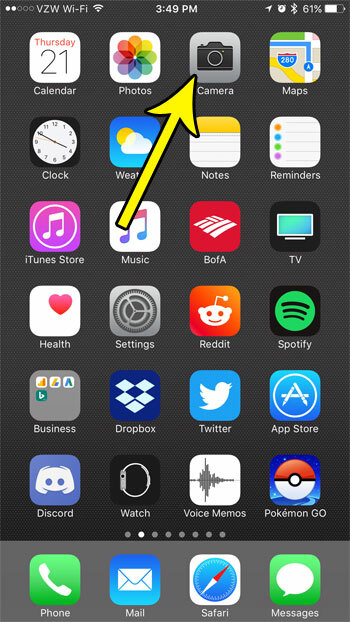 Step 2: Touch the button at the bottom-right corner of the screen that looks like the outline of a camera with two circular arrows inside of it. The button is identified in the image below. There are some other useful options on the camera screen, too. For example, find out how to turn off the camera flash if it is negatively affecting your pictures, or if you simply want to take a picture without using the flash.